At Church Interiors, our craftspeople are experienced and qualified to perfect our techniques for reupholstering furniture. Our specialty is pew upholstery and there are many affordable, as well as beautiful options to reupholster your church furniture. On-site use of factory upholstering techniques. NEW stain resistant fabrics available. On-Site Pew Upholstery costs 1/3 the cost of new pews. All work done on-site without interruption of Sunday services. Utilizing our own crews allows us to reupholster any church pews for less cost than original manufacturer. Pew repairs and on-site refinishing available. Pew upholstery costs less than pew cushions. Our professionals have found that the fabric will not stretch tightly and evenly by hand stretching. Our stretching methods are the same as our manufacturer and is set up at the church. The fabric is mechanically stretched very tightly from end to end and across the front edge uniformly. 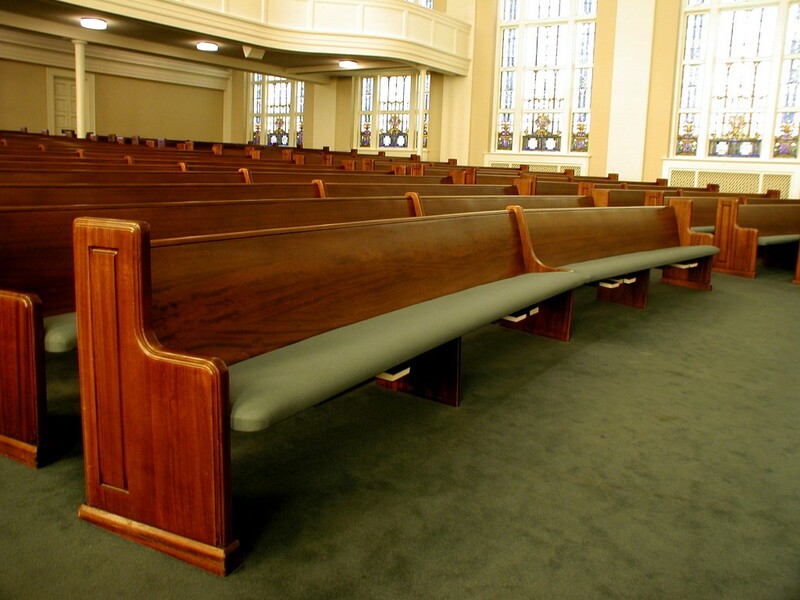 The appearance of your newly upholstered pews will mimic the original factory pews. Note: Our standard warranty does not cover sunlight damage. High UV fabrics are available. Inquire for more information.